Within this general category of operations, subordinate CDRs of assigned or attached forces conduct either single-Service or joint operations to support the overall operation. 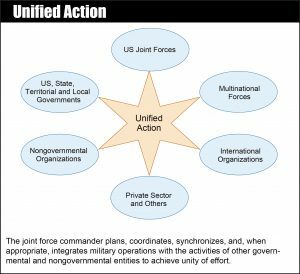 Unified action synchronizes, coordinates, and/or integrates joint, single-Service, and multinational operations with the operations of other USG agencies, NGOs, and IGOs (e.g., UN), and the private sector to achieve unity of effort. Unity of command within the military instrument of national power supports the national strategic direction through close coordination with the other instruments of national power.